The second century Greek astronomer Hipparchus ranked the visible stars in brightness from First Magnitude (+1), the brightest, to Sixth Magnitude (+6), the dimmest. With modern instruments the scale has been modified so the brightest star, Sirius, is magnitude -1.5. Under very dark skies the naked eye visual limit for most people is around magnitude +6 or +7. You need binoculars or a telescope to see dimmer stars. A magnitude +5 comet is harder to see than a +5 star because the light of the comet is more diffused than the pin point light from the star. At magnitude +7 at its closest approach, Comet 45P be difficult if not impossible to see with the naked eye. In comparison, Comet Lovejoy was about magnitude +4 when I took the above photo and it was easily visible to the naked eye at a dark sky location. But you don’t have to see Comet 45P to photograph it. You will be more likely to capture it on camera than see it with your naked eye. Here’s what you need to know. Read the “Focus Your Lens at Infinity” section while it is still daylight. The darker the location you find the better off you will be. That means get as far away from city lights as possible. You also want to be out when there is as little moonlight as possible, which means early in the morning. If you can’t get to a dark location, try anyway. You have nothing to lose. At the very least you will get some star photos and learn about about night photography. The problem is, depending on your location, sky fog from city lights can wash out the sky in your image before your camera can pick up the faint light of the comet. You will need a tripod, a camera that can take exposures as long as 30 seconds, and a wide angle lens (10 – 25 mm) that you can focus manually. Put your camera on a tripod and focus the lens at infinity. With a zoom lens that is harder to do than you might think because most zoom lenses focus past infinity. This article will show you how. It will work best if you focus the lens in the day time, put the lens in manual focusing mode, and then tape the focusing ring down with gaffers tape so it doesn’t move. Don’t use duct tape due to its sticky residue. If you can’t find gaffers tape try blue painter’s tape. Point your lens at the comet. You wont see it so you will have to guess at where it is. It will be in the ESE direction about 60-80 degrees above the horizon in the mid-Northern latitudes, depending on how far north or south you live and the time of the early morning you are out looking. If you extend your fist at arms length, your fist is about 10 degrees high. So the comet will be about 6 to 8 “fists” above the horizon. Straight up is 90 degrees or 9 fists above the horizon, so your camera should be pointed up at a pretty high angle. Sky map of Comet 45P in the ESE in February. This entire image is an area high in the sky. Click for a larger version. Every camera brand and sensor responds a little differently to extended low light photography, so these suggestions are approximate. Experiment by beginning with these recommendations. They are very much like the exposure settings used to photograph the Milky Way. Set your lens at a wide aperture like f/2.8 or f/4. Set the camera ISO at 1600. Then try 3200 and 6400. Try shutter speeds from 10 seconds to 30 seconds. The wider the focal length of your lens the longer your shutter speed can be without the stars moving too much in the photo. Try the rule of 500. Divide 500 by the focal length of your lens to get the longest shutter speed. If you are using a 25mm lens, the longest shutter speed is 20 seconds (500/25=20). If you are using a 15mm lens, the longest shutter speed you can use is about 30 seconds (500/15=33). Experiment. Have fun. If you aren’t getting anything and you are at your longest shutter speed, crank up the ISO. Comet 45P is much fainter than Comet Lovejoy (top image), so it will be pretty faint in your photographs. That is why you are using Milky Way type expoasure settings. If things don’t work out one morning, go out and try again the next. Look for a faint, tiny green smudge (smaller than Comet Lovejoy in the photo above) among the stars. The big comet photos you see published in magazines and online are taken with big, high powered telescopes and fancy computer guided clock drives. With thousands of dollars of equipment and years of experience you can do that too. But for now, you should be really pleased if you get a little green smudge. It’s a start! 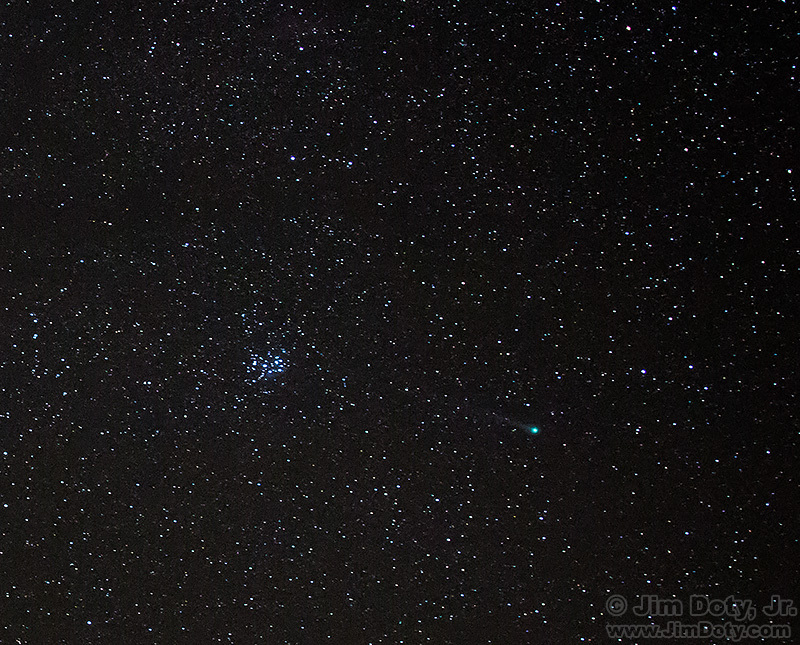 Comet Lovejoy Photo Data: Canon 5D Mark III. Canon 24mm f/2.8 lens. f/3.5, 15 seconds, ISO 6400. 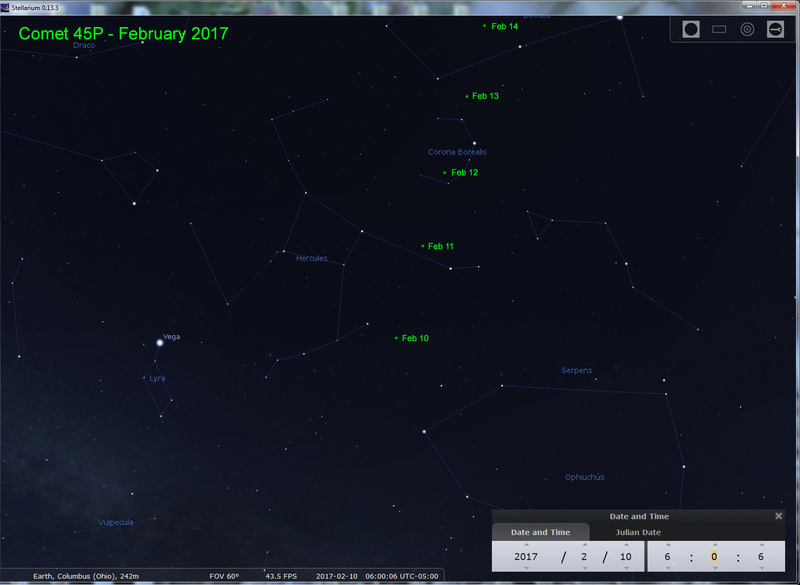 Stellarium – A great planetarium program for your computer and it is free. This entry was posted in General, Photographs, Using Equipment by Jim. Bookmark the permalink.